There’s a lot of advice out there for writing resumes. From the ideal number of job titles to the optimum length, opinions differ. But at least there’s one thing on which all can agree: It should be all about you. Right? Wrong. According to leading careers advisor, Marc Cenedella, that’s the first and single biggest mistake you can make. That’s not always easy. Typically it means putting yourself in the shoes of someone two levels above your current role. But Cenedella recommended focusing on how your work impacted your then-boss and how it could help your future employer, rather than what it meant to you. “You want to show your ability to succeed at the kind of job you’re looking for by advertising your past success in the kind of skills required for the job you want,” said Cenedella, who is founder and CEO of TheLadders.com, a careers site. One of the best ways to do that is to use numbers and stats to emphasize tangible outcomes, said Cenedella, who claimed there is “no role on the planet” that can’t be summarized in numerical terms. Sticking to numbers and keywords also has the added benefit of keeping your resume concise, said Cenedella. According to Ladders’ research, the average hiring manager spends just six seconds looking at a resume at the initial screening stage. As such, he recommended those with less than 10 years’ work experience to keep their resume to one page, while those with more can stretch to two. “The goal is to get your foot through the door, not tell your life story,” said Cenedella, who noted that the more detailed questions about your career history and your motivations will come if and when you secure an interview. Cenedella, whose books “Interviews Guide” and “Resume Guide” are both Amazon bestsellers, recommended starting with a professional summary — “I am an experienced X looking for …” — followed by a chronological list of relevant professional roles. Each professional role should feature a short outline of the company, followed by a few bullet points highlighting your key achievements. The amount of detail provided for each should correspond to the seniority of the role. For new graduates with little professional experience, those roles could be replaced with membership of university clubs and other social groups which demonstrate your “ability to be a top performer,” said Cenedella. He added that the page should be finished with contact details at the top and educational background at the bottom, keeping it clear and simple. “In my advice, this is not where you should be guessing or having creativity,” noted Cenedella, who advised against trying to go viral with a quirky resume. Instead, the A4 sheet should be “informative, interesting and relevant,” he said. “The reason you hear about these (gimmicky resumes) is because it’s remarkable that they worked,” said Cenedella, noting that such success stories crop up once in a blue moon. “If you’re the type of person who can create a successful gimmicky resume, please do – you don’t need my advice. But, in general, it doesn’t pay off,” he said. Cenedella also highlighted that such quirky resumes are much more difficult for computer software to read, which means that they may never get past the initial screening process. 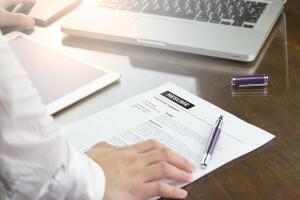 With algorithms likely to play an increasing role in the future of recruiting as hiring managers try to streamline processes and combat unconscious biases, clear and concise communication is set to remain king for years to come, he added.